An excerpt of Anatole Dolgoff’s memoir of growing up at the center of the twentieth-century anarchist movement. 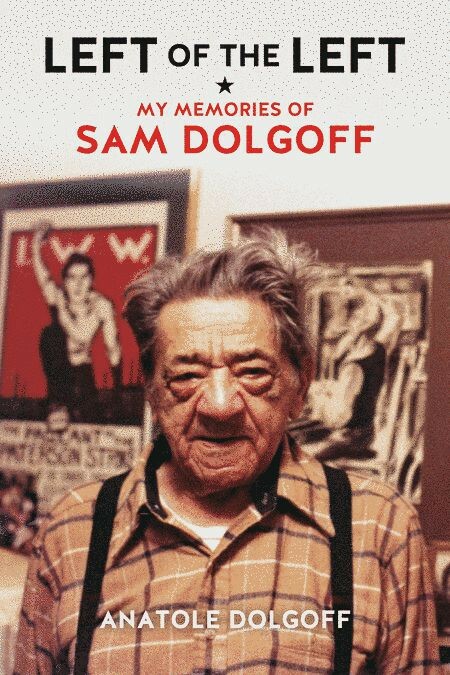 The book centers of Anatole’s dad, Sam Dolgoff, and includes a cast of dozens well known, forgotten and never known. Many years later, in the 1940s, Sam attended The Iceman Cometh, Eugene O’Neil’s bitter commentary on lost illusions, cowardice, and betrayal. One of the characters spends the entire play sprawled across a table in Harry Hope’s funereal bar, drunk; every now and then he rises to spout something vehemently incomprehensible before collapsing again. “That’s Hippolyte Havel!” Sam exclaimed. There was no doubt! Hippolyte Havel, flesh and blood human being, morphed into a character in an O’Neil play! That provides me the solution to a problem I have had. How to make accessible to people who were born after Sam died the breadth of his experience and the myriad people he knew so many years ago? Simple chronology—you know, first Sam did this, and then he said that—cannot convey to you the richness of Sam’s lifetime journey in the anarchist movement, which he embarked upon when he joined Road to Freedom. But we do have the movies, and a special one at that. Reds was the film I dragged Sam to so many years later, in 1982, for he disliked going to the movies. The film was finishing a fairly long run and the only theater showing it was at a Mall in Northern New Jersey. I had to drive him there. He insisted on paying for his own small paper cup of coca-cola in the lobby. “A buck fifty? Why you can’t be serious man! Maybe you should wear a mask and gun?” Sam growled. The young fellow behind the counter, probably a suburban high school kid born into an entirely different world, caught the glint of humor in Sam’s eyes and smiled indulgently. That was the last bit of indulgence he received as he proceeded to wreck the film for the sparse audience scattered throughout the dark cavernous space that mid-week afternoon. The problem was in the details. Sam was nearly deaf at this stage so I had to trundle him up front, where, with his swollen belly, he sat on the edge of his too small seat, leaning forward on his wooden cane, breathing noisily, trying to catch the dialog. He knew personally or was familiar with nearly every character in Reds. This included many of the aged witnesses, who were, after all, his contemporaries. As the film got going, Sam became involved and growled comments on the proceedings, his gravel baritone blasting into the darkness. There followed from the audience, like a Greek Chorus, a call and response session. An aged lady I do not remember appears on screen. Big Bill Haywood shows up in little more than a bit part for a line or two. Then, toward the end, there is the touching if slightly absurd montage of the devoted Diane Keaton, in the attempt to reach the dying Beatty, hiking through the Soviet snow in a blizzard. Apparently, she is not allowed to enter Moscow directly. “Come on, it is almost over anyway,” I say. Outside, in the bright sunlight of the parking lot, some of the film’s patrons can barely contain spitting at us; seeing an old man in suspenders with white socks showing beneath the cuffs of his pants made them angrier. Their fury was directed at a character that could have walked directly out of the film. On the way home, in the car, I search for something about which Sam and I can agree: “How did you like the guy who plays Eugene O’Neill?” It was Jack Nicholson, who has an affair with Bryant in the film. I enjoyed his performance. Their paths had intersected in the radical, artistic, bohemian circles of the time. Early on O’Neill had shipped-out—that is, worked as a merchant seaman—and had been a Wobbly, and hung out with anarchists. He was not yet Eugene O’Neill. Sam’s off-hand comment surprised me. “You know that? You knew Eugene O’Neill? You drank with him? Why didn’t you tell me?” I felt, while not hurt, put-out. I suppose he was right in the scheme of things. Sam was always pulling surprises like that. He did not think that knowing famous people was important. Sometime later, I mentioned a PBS documentary on Diego Rivera. Sam smiled and said simply, “Diego was a good guy. You couldn’t help but like him.” They had met several times in the early thirties at radical meeting halls on lower Broadway and at a Union Square diner so infested with Communists it was called The Kremlin. As I’ve mentioned, the purpose of my autobiographical, cinematic diversion is to make accessible the richness of Sam’s life nearly a century ago. He came to know personally virtually everyone who mattered in the radical movement of his day or he came to know of them intimately through their friends and enemies. Not that he thought his life was rich; it was simply his life. That was amazing. Really looking forward to the book. This looks brilliant. When's it out? Sums it up well -- and, of course, Emma was right! "The cover photo must've been taken damn near the end. His emphysema was super bad at that point. Having known Sam and Esther since 72/73ish they were links to an important libertarian and anarchosyndicalist past. I prefer to remember the positive. As Sam used to say, all people have their vanities and frailties and Sam surely was no different. That said, I look foreword to reading the book." The woman had a bad case of integrity. It made her glorious and impossible at the same time—which being which depended on one's perspective. What do you make of this incident? PS 147, I'm in the sixth grade. Wednesday is assembly day. Our class is scheduled to put on a show for the parents seated in the school auditorium. All the boys must wear a white shirt and tie, the girls a dress of a certain type and length, the hair combed a certain way. It is a bit of a big deal and Mother dresses me carefully, makes sure my hair is parted, my nails clean. We march on stage singing "God Bless America" to the accompaniment of Mrs. Addlebaum, the piano teacher. Two huge American flags hang stage left and right. We take our places between the flags—me at the end of the third row. The auditorium is filled with smiling parents, their smiles merged in one huge smile of welcome. I pick out Mother seated prominently in the center of the curving rows, beaming. Tap, tap from Mrs. Addelbaum. All rise for the "Pledge of Allegiance". The entire auditorium stands as one, hands over hearts. All except Mother. She simply sits, beaming, a lone seated figure in conspicuous contrast. "What's wrong with your mother? She sick? Why won't she stand up? my classmates whisper. I stare ahead in silent humiliation as Mother sits through the whole pledge. She seems oblivious to the quiet sneers of several hundred people and to the position in which she has placed her son. "Why don't you stand?" I asked imploringly on the way home. "Your mother does not salute flags." "To see my son. I didn't know they were going to do that." "But they always do. Couldn't you just stand and pretend?" "I do not pretend. I do not salute flags." ^^^ "Funny", we always encounter this at our kids school events. I know stand up so as not to embarrass the kids anymore. And hear the BS at kids events by all these crew cut idiots. Its funny, anyone who knew Esther Dolgoff would know exactly what Anatoly meant about her being "oblivious". That WAS so Esther! So I finished this book a while ago now. Read it in under a week. I don't really read books very often anymore, so that surprised me. Overall, a pretty good read. Since I've been digging into this era of American anarchist and IWW history it had a lot of relevance, personally. There are a lot of names just casually thrown out there, many I've never heard before, so its been fun trying to track down information on them. The personal aspects of the book are the highlights. It's easy enough to find information on the bare facts, like what Sam Dolgoff or anarchists of that time did, but not as easy to hear about how they lived and how they interacted with family, friends, comrades etc. Very interesting stuff. Some of the recollections around the syndicalist/bohemian split or how Dolgoff and some other Old Left anarchists viewed the New Left was also illuminating. In the end, people like Dolgoff and Old Left anarchists, despite their radical politics, were very traditional, old-fashioned people who had trouble interacting with others that were not also like that. On the flipside, some of the bohemian and/or New Left types had pretty typical individualistic politics that I would consider not very radical at all, but very much in line with American traditions, but they lived their life and conducted themselves very much non-traditionally. There's a number of things mentioned within the context of the USSR existing and how anarchists then viewed certain situations that I'll always have trouble with comprehending because that isn't what I grew up in. For example, Dolgoff left the painter's union, accepting lower wage jobs that were inconsistent (and could be argued were undercutting union work...) because the union was led by Communists. It is hard for me to really understand or agree with that. Also his views on the civil rights movement are somewhat quirky to me. Dolgoff, a radical anarchist who spent a lot of time dedicated to the cause of the (armed) Spanish anarchist movement, found in MLK a more sympathetic figure while considering the Black Panthers to be 'proto-fascist'. I found that bizarre and found great difficulty in trying to think of any way or reason the BPP could be considered that at all. They were internationalists that worked with radical ethnic groups of all persuasions. Guess I'll mention that I found some of the writing, specifically when the author speaks about individual women or persons of color a bit...awkward. I don't think they are necessarily racist or sexist, but some of the passages I felt uncomfortable with and looked forward to the topic changing. Probably just draw that up to the author being an older, white guy who grew up in segregated America. Anyway, this is a valuable book that gives a bit more understanding to that era of American anarchism, and definitely worth reading. I look forward to the book which I should get in a few weeks. Context: For the sake of now being an "older" militant (in 60s), I can fully understand how things of 60 and 75, 80 plus years ago seem so foreign today. Hell, stuff even 45 or so years ago will seem foreign to younger comrades today. And in a few years the post Seattle generation will face the same thing, if not already in this viral and virtual world. All I can say is everything has its own context. Sometimes we are products of our times. And Sam and Esther were as well. The question of the Soviet State, the Eastern Block and so forth really needs to be placed into a couple of contexts/ the brutal repression of anarchists (and others) by the Leninist state. The rise of Russian-Soviet imperialism and imposition of state communism in those lands its troops were in or national liberation movements it supported. The internal iron fist 5regime in the name of Marxism and socialism. We often look at the CPers of the 20s and 30s in a certain way. Militants involved in mass movements and so forth, as portrayed in the many histories we read. That said, I have heard some really nasty stories about CP hacks and the way they become real bureaucrats, petty and otherwise. And authoritarians when dealing with others outside their party or orbit. Such as trying to break up wobbly, anarchist, socialist and so forth outdoor meetings with lead pipes. So the passion that Sam felt was based on interactions and experiences most of us have not had. A key, I think, is to not only learn the lessons of your day, carry them forward but also try and be as open minded as principally and personally possible. Sam was not always open minded when it jived with his fundamental perspectives. It was not always the disagreement, but the way in which he just nastily replied or took you on. He could not, at times, disagree without being disagreeable. I always remember this and have always tried to be the opposite. Not sure I have always succeeded, but try and put myself in the shoes of the comrades coming after me. How would I feel being put down without a chance to work it through or talk it out. Sometimes it just don’t, but try and be as much of the day as possible, try and see how some things changes, without the core of the libertarian spirit, methods of work and final goals be all that different then ones own. Of course, there are limits and bounds. And I thought the stuff from the “Views & Comments” days were reflective of a much more nuanced and “of the day” spirit. And Sam’s piercing critique and suggestions put forward in the “Notes for a discussion on the regeneration of the American labor movement” were efforts at being as contemporary as possible. On the Panthers, the old timers, across most party and organizational lines, were in general taken aback by the Panthers for a whole host of reasons. I recall reading in the ex-CPUSAer Al Richmond’s ''A Long View From the Left,'' (1973), how he wrote about this. But he made an interesting observation. He chastised his contemporaries (veterans of the 1920s-40s) on their criticisms. He said that most of them had forgotten their youth. A youth that was filled with instances of armed self-defense (1929 Gastonia textile strike I recall), of being run out of town, of many political trials and so forth. He said remember your youth; remember some of the stuff you engaged in before being critical of others. I can prolly ramble some more but care not to bore you with my yammer. Yes, I do agree that context is important. Things have to be situated within their proper context in order to understand why people did and said what they did. But one can go too far with this, using context as a shield against any sort of criticism or disagreement. I don't know where that line is, but it seems it should be acknowledged that the line exists. I am, or at least I think I'm aware of the context of Communism and the anarchists during this period. I do not hold a glorified view of the former. I guess it just seems to me that if an influential anarchist militant chose to abstain from a union because it was led by liberals or Republicans, political categories no less historically dangerous to anarchists than Communists, most of us would think that position as maddening or poorly thought out. Maybe there was more to that story that his son did not know of. I'll have to check out that Al Richmond book. Sounds interesting. I agree, A Long View from the Left: Memoirs of an American Revolutionary is fully within CP orthodoxy, with all its faults spelled out clearly to see (by us libcommers, not by Richmond's intent). But the chapters "On the Waterfront" (1 & 2), are amazing first-hand glimpses into maritime rank-and-file organizing by the CP's Marine Workers' Industrial Union on the docks of New York, Philadelphia, Baltimore (where in the mid-1930s sailors successfully fought the draconian rules at the the "Dog House," Seamen's Church Institute, shelters and were soon creating the sailor-controlled hiring hall with their Centralized Shipping Bureau in what was called the "Baltimore Soviet") and San Francisco. Now I can be conflating Richmond's book with Irving Berstein's The Turbulent Years, which I also just read, but both these accounts of personal experience talk about class war highlights, like the 83-day West Coast Maritime Strike that exploded into the 4-day San Francisco General Strike. Both books also talk about how the experience of that cross-sectoral mass strike set the tone for the 1936-1937 national seaman's strike, where 40,000 workers from all the maritime trades (including longshoring) went on a 99-day strike to win a hiring hall for sailors like the one West Coast dockers won in 1934. The strike completely paralyzed East, West and Gulf Coasts, but management's response was brutal -- often working closely with reactionary AFL bureaucrats -- and it cost the lives of 27 workers. So you must read between the lines of the ideological parts about the glories of the Communist Party and their heroic actions in defense of the Soviet Union, but there are still gems about working class self-activity that can be plucked from these memoirs. "Young friends - A Nasty Fight" (313-317)....... Juan, this is the nasty BS section. Apparently a majority of this wasn't even written by Anatole, but by Jeff S. of Anarcho-syndicalist review/libertarian labor review. What a shame as it is just packed with the same falsehoods they have been peddling for decades. But it is true, it has been and continues to be a nasty fight. Yep that was the section I was referring to when you asked me about it. Agreed, it's nonsense. syndicalist-- not sure if you saw this comment under the book review, so thought I'd bring it up here. IIRC Dolgoff also had some pretty uncritical views of Israel, bordering on a "civilizing mission" type position. Slowly making my way through some of the chapters. Have not really started from the beginning yet. I continue to laugh and chuckle as I can "literally" hear Sam and Esther's voices. And can picture their 208 East Broadway address (can't recall the number), Lower East Side apartment with all the clarity as described. If there's any book you can dip in and out of without regard to the order, I think its this book. While there is some order to it, overall it jumps in and out of different times. So what's the story about it being co-written by the ASR people? It seems to me that only one portion of it was written by ASR people .... Prolly the section which makes me pukes...... "Young Friends - A Nasty Fight" (pp 313-317) where there is talk about the ACF. Apparently Anatole asked people from LLR/ASR to submit their recollections. These were then incorporated into that particuklar section. I'd assume it refers to a specific people or nation civilizing the barbarian hordes / primitives. In this case, it seems as if Dolgoff thought of Arabs or Arab society in terms that are less than flattering. But that's just an interpretation. Wasn't aware there was a story. There are some parts of the book that deal with later years, which feature accounts, which are clearly marked as being letters/emails from people who we would recognize as being from the ASR milieu. The down side to Sam, in the later years, was a certain way of dealing with those who did not fully agree with him, following his words with bated breath. But then he could flip and compliment you. Anyway, those who founded LLR/ASR questionably followed Sam and were closer to the Dolgoff's on a certain level. Hence they were invited to write what they did, I mean in terms of contributing to the book. From Dolgoff's "Fragments" (152,154). Some of this is Dolgoff paraphrasing the (then older) Yiddish Israeli speaking comrades in the 1980s. At this point there really wasn't a Hebrew and/ or Arbic speaking movement comprised of younger comrades. "Everyone knows that by us in Israel there is no shortage of dema- gogues and liars. The government ruined the economy, spread chauvinism, reinforced the power of the clergy, sharpened the en- mity between us and the Arab people.... We deplore the hypocrisy of the Israeli Labor Party. They blame the Begin government for everything, but they have themselves been guilty of the same crimes when they were in power. We know from our own experience that politicians and diplomats neither will, or can, ever achieve peace between nations. They find it easier to make war than to make peace. A state of peace involves understanding and agreement between peoples, not capitulation of one party to another. But peace is never made in good faith or with- out ulterior motives. This is why it would be easier to conclude peace with the Arab people than with their rulers. To achieve this we must renounce ruling the Arab people in Israel, abandon our snob- wish attitude, and together with them live in brotherhood. " increasingly corrupted by the cult of state centralization. Now, over thirty years later, we see how heavy a price in freedom of action, in loss of morale, in creativity, in self-management, the Israeli people are paying for their submission to the state; a swollen bureaucracy, the continuing degeneration of the kibbutzim into de facto capital- ist enterprises with low-paid wage labor, private property, production for profit and the other "blessings" of capitalism. In spite of all this, the Israeli comrades are forced, like the other tendencies, to accept the fact that Israel must be de- fended. The day after the proclamation of the state of Israel (15 May 1948) Assam Pasha, Secretary-General of the Arab League, threatened that: "This will be a war of extermination and momentous massacres like the Mongolian massacres and the Crusades." In discussion with Israeli anarchists it was em- phasized that the unilateral dismantling of the Israeli state would not at all be anarchistic. It would, on the contrary, only reinforce the immense power of the Arab states and actually expedite their plans for the conquest of Israel. Israel is a tiny, impoverished land lacking the indispen- sable military and economic resources to defend itself without outside help. Its very existence depends upon the military, fi- nancial and economic support of the United States, and, if need be, its direct military intervention. It is to all intents and purposes reduced to the status of a satellite subject to the control of the United States. Far from curtailing the concentrated power of the state, the necessity for defense of Israel-freely acknowledged by our comrades-depends upon putting into effect the indispensable military, economic, legislative and social measures needed to keep Israel in a permanent state of war preparation. Such war preparations, instead of lessening, only accelerate the trend toward despotism, the permanent characteristic of every state. The Israeli anarchists (and they are not the only ones, the non- anarchists too) know only too well that curtailing the power of the state under such circumstances offers no real alternative. But they do feel their moral obligation as anarchists to resist as much as they can the growing despotism of the Israeli state. " Right. "Critical" support of the "need" for Israel to defend itself. Lamenting the degeneration of the kibbutzim, while not a word is said about displaced Palestinian farmers. "The Arabs" are a uniform group whose simple plan is to obliterate Israel. Therefore dismantling the Israeli state is a non-starter, because it would just open the door to being conquered by "the Arabs." It's pretty disgusting. I honestly lost a lot of respect for Sam when I read it.